We have been drinking Pukka tea for many years in this household. They have a wide range of interesting organic teas that are ideal for non black tea drinkers like me. However, until I was sent some products from Pukka to review recently, I didn’t know that they did anything other than tea. Looking at their herbal website, I can now see they sell all sorts of interesting health products including Ayurvedic herbal supplements. I am particularly taken by their organic ghee which I’ve never seen for sale before. Well it seems you are never too old to learn. The other thing I noticed was that everything seems very reasonably priced. 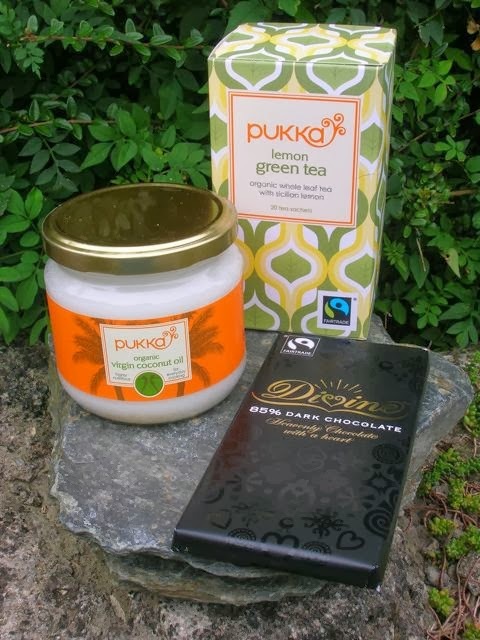 I was recently sent a pack of Pukka green tea with lemon, a jar of their own brand coconut oil and a bar of Divine 85% Chocolate. A jar of organic virgin coconut oil is always to be found in my kitchen. It’s purported to have many health benefits including being instrumental in weight loss. It also has a high smoke point making it ideal for frying food. I often have it spread on my breakfast toast with a smidgen of my chilli sauce, which is not only tasty but also kickstarts my morning. The quality seems to vary quite a bit from brand to brand I’ve noticed and the most expensive aren’t necessarily the best. I could tell immediately on opening the jar that this was a good one. It smelt heavenly, unmistakably coconutty, so it hadn’t been deodorised like some I’ve come across. The taste was of a freshly cracked coconut and better than some of the other brands I’ve tried. At £7.95 for a 300g jar, this is competitively priced compared to some other brands. At the moment, the coconut oil is on special offer at £5.95. As well as on toast, I’ve used coconut oil in cooking and to make raw chocolates, but I’ve never used it in baking before. Now seemed like the perfect opportunity to correct that omission. In celebration of #OrganicSeptember and to make the most out of the products I was sent, I wanted to create something sweet and delicious that was also as healthy as possible and contained no dairy or refined sugar (apart from the small amount in the chocolate) thus making them suitable for vegans and guilt free – always a bonus. These oat, coconut, fennel chocolate chip cookies were the result. The tea was light and very refreshing and works particularly well as a breakfast beverage – you can find out a bit more about it on my Breakfast Bites post. Pukka customers think the tea goes so well with dark chocolate, that Pukka are now selling Choc au Citron for the perfect guilt free tea break. This consists of a pack of the lemon green tea and a bar of the Divine chocolate that I was sent and is priced at £3.99. However, I used the lovely bar of Divine chocolate combined with the coconut oil to bake two items: oaty biscuits and rice pudding – both dairy free. As if the coconut palm doesn’t already give enough, I used coconut sugar too. Chocolate chip cookies are always a winner. These biscuits were superb. The subtle but tasty addition of ground fennel seeds, gave these an intriguing air of sophistication, despite their rustic oaty look and texture. It worked surprisingly well with the flavour of coconut too. My oat, coconut, fennel chocolate chip cookies are crisp, chewy and delicious. Do give them a go. Simple to make, dairy free and healthy too, these chewy cookies are delicious and will keep in the biscuit tin for a few days, if you can manage it. Cream the sugar and oil together along with the fennel until light and fluffy. Add the oats and coconut and stir. Sift in the flour, salt and baking powder and stir until just incorporated. Add the chocolate and stir until just mixed. Divide into 15 lumps and roll into balls. Place on a lined baking tray and press down to flatten a little. Bake at 180°C for 10 minutes or until golden but not dark. Remove onto a wire rack to cool. The oat coconut fennel chocolate chip cookies were superb, crisp on the outside and chewy in the middle and very very moreish. 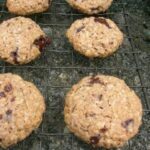 As they are oaty biscuits. I’m entering them into this month’s Tea Time Treats where the theme is Flapjack, Oats and Traybakes with Karen of Lavender and Lovage and Kate of What Kate Baked. As this is all about coconut, I am entering both my biscuits and rice pudding into Lets Cook with Coconut over at Simply Food. And as everything was cooked from scratch, I’m also sending the biscuits over to Made with Love Mondays over at Javelin Warrior’s Cookin w/Luv. With the subtle but tasty addition of fennel seeds, the biscuits are also being sent over to Cooking with Herbs with Karen of Lavender and Lovage. Put 1 tbsp coconut oil in a pan and melted over medium heat. Crushed 3 cardamom pods lightly and added to the oil. Added 50g of arborio rice and stirred for a couple of minutes or so ensuring that the rice was coated in the oil. Added a 400ml tin of coconut milk, 1 heaped tbsp of xylitol and 50g chopped 85% chocolate. Brought to a simmer, stirring until smooth, then poured into a greased oven proof dish. Baked at 150°C for 45 minutes (1 hour would have been better, but I was in a hurry). The pictures didn’t do justice to this very tasty dish. It was creamy and chocolatey with a pronounced coconut flavour. Thanks Laura, you wouldn’t know these biscuits were almost good for you, they taste so good. Yes of course I will enter your challenge – have just done so in fact. Just stumbled upon your blog (as I sit drinking organic, fair trade peppermint mint and eating some organic fair trade 80% dark chocolate, it seems like it was meant to be) and love the concept – what’s not to love about chocolate. The package you were sent looks great, how lucky for you. And your recipes look great, I especially like the biscuit, I’ll have to give them a try very soon. Thanks very much for visiting Barbara. Drinking peppermint tea whilst eating chocolate sounds like a fabulous idea. The biscuits are delicious, though I say it myself and fairly low on the guilt level too. Love the idea of adding a little fennel to the cookies, what a great twist. Thanks Katie, fennel works quite well with chocolate – as long as you don’t use too much. The rice pudding was very nice. CC, you’re right, these would still be great biscuits without the fennel. I’m thinking of trying cardamom next time. The chocolate rice pudding looks to nice to be rice pudding, might give that a go as it looks amazing. Thank you Babucho, but rice pudding is nice – isn’t it? These are amazing. Chocolate and coconut is certainly a great match. Delicious cookies! I haven’t used coconut oil for anything before but I love love love coconut! These cookies look delicious! Chocolate and coconut are just perfect together. Spread on toast with chilli sauce for breakfast sounds interesting though!